Rumors that Nvidia is about to unveil its powerful GTX 1080 Ti graphics card have been swirling, with many suggesting that an event held in San Francisco on February 28 by the GPU maker would see it officially announced – and it looks like the company may have accidentally spilled the beans early. In a bid to drum up more hype for the event (if any more was needed), Nvidia’s UK Twitter account tweeted a link with the words ‘It’s almost Time. 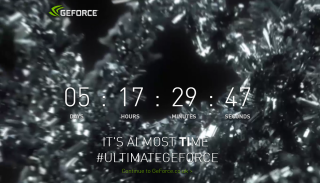 #UltimateGeForce’. As if bolding the 'Ti' in ‘TIME’ wasn’t enough of a clue, people who visited the website and viewed the page source saw that the video was labelled ‘GTX1080Ti_countdown’. This has since been changed, but the cat appears to be out of the bag. So, has Nvidia spoiled its own surprise? Maybe not, as the emphasis on ‘Ti’ in ‘Time’ all but confirmed it anyway. We’re attending the event on February 28, so we’ll update you with any more breaking news on what Nvidia has in store. When is the best time to buy a new CPU or GPU?